My birthday is coming up, it's time to learn how to make cocktails. Ensures preregistered portion control Helps mix cocktails quickly and efficiently. Prevents drips and soils. Fits most size liquor bottles. Controls the pour for more accurate measurements. 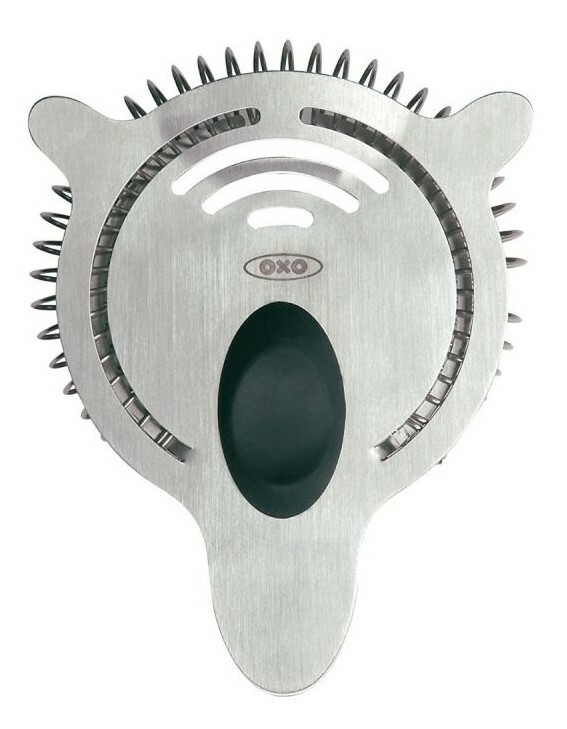 OXO GOOD GRIPS STEEL ICE TONGS . All goods are Dishwasher Safe. Ice. Usually used crashed ice, but since there will be minors among the guests, I will prepare non-alcoholic Mojito and I will use figured ice for more beautiful look. If you decide to make Mohito after this article and use crushed ice, put it in a tight plastic bag, and wrap the bag in a towel. Then knock on it with a rolling pin or a hammer for chops until the ice turns into a fine crumb. 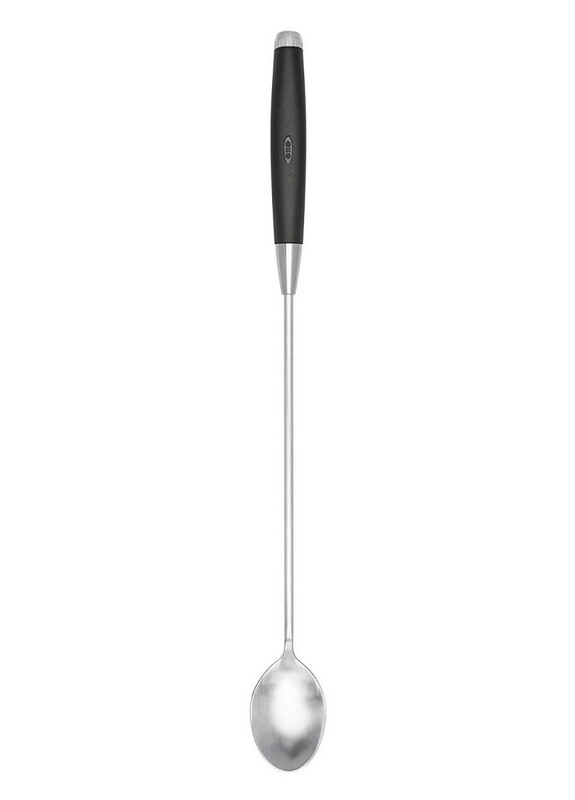 OXO Spinning Bar Spoon 12IN. Washing lime and cut in half. One half of lime cutting into small slices, the other half I'll use to decorate the finished cocktail. Washing mint and separating the leaves from the twigs. Putting into the cooled glass. Crushing with Spinning Bar Spoon until a bright mint flavor appears. To make sugar syrup, using pour 3 tsp of sugar into a small saucepan and pour 3 tsp of water. Bring to a boil and dissolve the sugar. Once the sugar has dissolved, the syrup is ready. 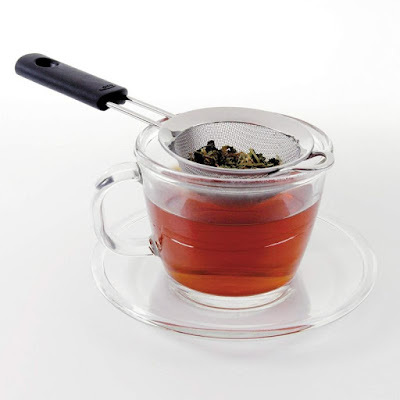 Cool the prepared syrup quickly by placing the pan on ice or in cold water. I don't eat sugar, so I'm adding honey. Also Instead of sugar syrup, you can add sugar in a glass with mint and lime. In this case, it's better to add a little soda water to the sugar and stir until the sugar is completely dissolved. Sugar can be used white or brown. Brown sugar gives Mojito a subtle caramel flavor. 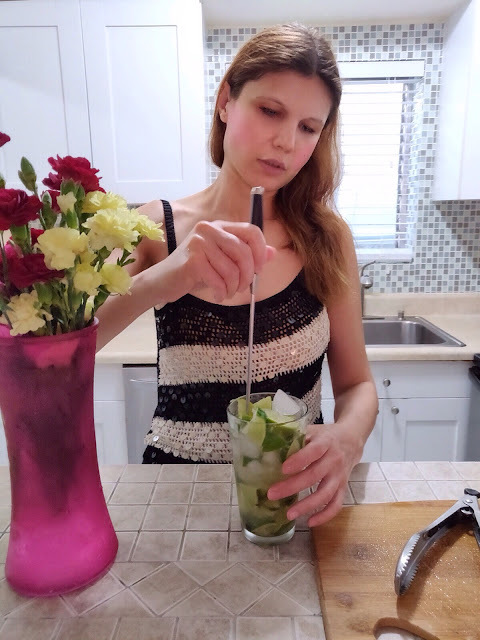 If you making alcoholic mojito - just add rum to the cocktail. the ingredients from the bottom of the glass. CONTOURED HANDLE provides a comfortable grip. Spoon spins while you stir for effortlessly professional result. 12 IN LENGTH easily gets to the bottom of tall mixing glasses. And also knead until the juice appears. Now you can pour in rum, if you making alcohol Mojito. Adding ice into the glass to the top. With OXO GOOD GRIPS STEEL ICE TONGS, STAINLESS STEEL I'n not worry about slipping on errant ice cubes scattered on the floor, thanks to Ice Tongs’ sharp teeth! They make it easy to grab and hold ice and place it into glasses. Soft grips and a locking switch provide comfort and convenience. . Because they get a solid grip on ice when . serving cocktails. 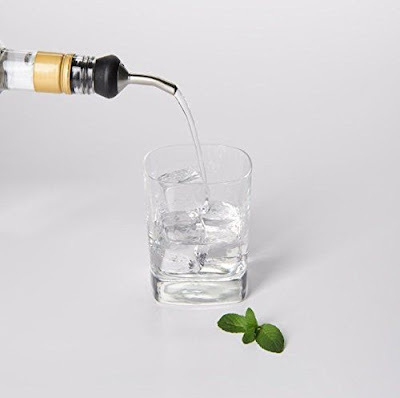 Chilling drinks requires gently spinning , especially if you making spirit-based ice in the glass to keep the cocktails crisp and clear, and to help prevent frothing or unwanted ice chips that could occur while shaking – OXO GOOD GRIPS STEEL SPINNING BAR SPOON, helps to stir like an expert that's very important, because the proper technique required to stirring and also prevent the ice from chipping. Pouring sparkling water, filling the glass to the top. Garnish Mojito with a slice of lime, a sprig of mint and serve immediately. It's 82 degrees today the ice is melting fast and the stars of ice are become rounded. Apparently, next time, I will use crushed ice for the preparation, add figured ones for decoration just before serving. 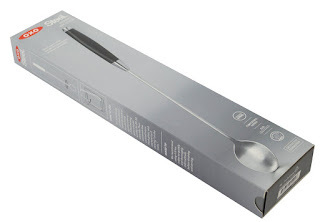 La Cuisine Appliances Promo Codes & Deals for the most updated list of deals..